When Uber driver Jim Harris was driving a passenger home from last week's Eagles parade, he got caught in a 'mob' of fans on Broad Street. The scene turned from celebratory to hectic quickly when people jumped on, kicked and rocked his Toyota Prius. 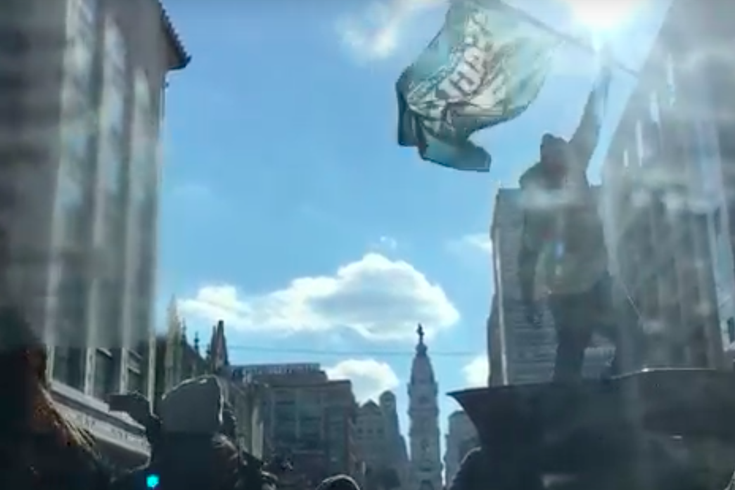 When legions of Philadelphia Eagles fans descended upon Center City for last week's parade, James Harris was as happy as anybody in town, even if he decided to work an Uber shift instead of joining the party. "I love the Eagles," he said. "But I was robbed of that." Instead of basking in the celebratory afterglow, the Lansdowne, Delaware County resident said he spent much of his Thursday filing a report at the Philadelphia Police Department's Ninth District precinct. 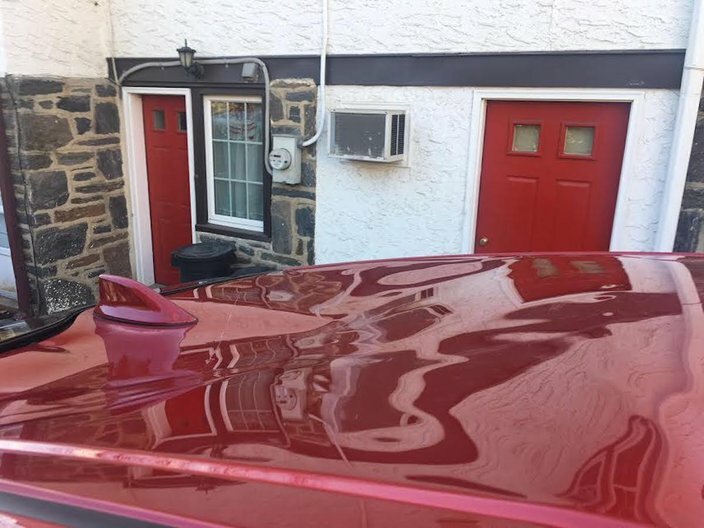 According to Harris, a group of yet-to-be-identified fans trampled his vehicle in the middle of Broad Street, causing anywhere from $4,000 to $9,000 in damages. It all started just after 1 p.m. when he picked up a passenger on Mt. Vernon Street in Fairmount for the ride home to Northeast Philadelphia. His fare, known only to him as Matt as identified in the Uber app, had partied a little too hard that morning, ran out of money and had to call it an early day. Harris steered his red Toyota Prius – the same model featured in commercials during last year's Super Bowl – toward Broad Street in an attempt to get to the Vine Street Expressway. Before he reached Vine Street, he pulled behind an SUV stopped in the middle of Broad. He didn't think much of the delay as Meek Mill's "Dreams and Nightmares" blasted from four loud speakers facing out the back of the vehicle. Matt was already passed out and Harris was still in the celebratory spirit. "Everything was fine," he told PhillyVoice during a Friday morning interview. "It was really festive. I was into it. I took a video thinking I might upload it to a TV station. It looked that good. Some of the damage to Uber driver James Harris' 2016 Toyota Prius is evident in this photo. By "ugly" he means a man "jumped up on my roof and started jumping up and down, landing on my car with great force." His car was surrounded by dozens upon dozens of people. He honked and shouted to no avail, but didn't get out of his car "because the crowd was getting increasingly agitated." Before long, the man jumped off and disappeared into the crowd, but Harris' nightmare continued. As he tells it – and is clearly evident in the video embedded below – other people in the crowd "started to bang on my car and rock it back and forth." By now, the driver was scared and his passenger was awoken from his nap. "I feared, as I'm sure my rider felt, that they would try to flip my car over," he said. "Thankfully, somebody in the crowd pleaded 'Stop' and they did." He heeded someone's suggestion to try to drive away, at about five miles per hour, but "some idiot jumped onto my windshield as if he was some kind of hit-and-run victim." Finally, he was able to break free of the crowd and get Matt, who he was worried about vomiting inside the car, on the road home. "He was apologetic for the damage to my car," Harris said. "I told him it was not his fault. I did ask if he would testify on my behalf and he said he would be glad to. I don't know why I didn't just call 911 then and there. But I felt I had an obligation to get my passenger home." In the four-and-a-half minute video Harris shared with PhillyVoice, the car-roof jumping starts at the 1:45 mark. At the 2:18 mark, the screen goes blank, but you can hear Harris pleading for the partiers to leave his car alone. A woman urges him to just drive away while he can. "I just want to get out of here. C'mon!" he says. "I'm going forward. Get out of the way. Get out of the way." If Harris thought that was the worst of it, he was wrong. The next day, he went to the Uber offices in Southwest Philadelphia to file a report and seek help with insurance. When he was leaving, a Jeep with a metal grid rear-ended him at Bartram and Island avenues. The price tag for those damages? An additional $7,500. He said police officers told him that he wasn't the only driver whose car got stomped on the day of the parade. He rued what happened to him and his car, but had a measured approach. "I've finally gotten to the point where I can joke about it, but that day, after it happened, I totally forgot about the parade and everything that was going on," he said. "I'm a lifelong Eagles fan like everybody else. Them winning the Super Bowl was one of the greatest moments of my life. This spoiled the whole day for me. "I keep hearing people say there were only a few minor problems at the parade. Well, this was a major problem for me. The joy was gone."